The Castle Behind Thorns is a tender, profoundly relevant twist on a fairy and folk tale formula. After an argument with his father and a plea at a saint’s shrine for peace and understanding between them, Sand awakes in the fireplace of the Castle Behind Thorns. Sand has grown up hearing the stories about the castle: how its inhabitants fled after an earthquake that tore the castle apart and the hedge of thorns grew up around the ruins. He quickly realizes as he explores the castle and grounds that whatever happened was NOT an earthquake, but a sundering of stupefying proportion. Sand knows an earthquake cannot rend an anvil in half. When Sand attempts to bypass the thorns surrounding the castle he discovers they have a life force of their own…and they have NO intention of letting him pass through them into the outside world. Unsure how long he will be trapped within the thorns Sand, almost without realizing it, begins to mend the castle. In the course of his explorations Sand unwittingly resurrects a former resident of the castle–Perrotte. Perrotte was murdered by her stepmother–who now rules the region with her daughter–in the castle as a young girl. She is, understandably confused at first, then angry as she remembers what happened to her. What would it be like? To be free of the pain and grief she felt, the anger that welled in her every time she thought about the thing that had happened to her, the death she’d received, the years and people she had lost? […] What would it be like to remember the past without wanting to scream and to cry? Without feeling like a burden rested on her shoulders and her heart? […]Would life feel like it did when she stood shoulder to shoulder with Sand at the forge, creating the spherical astrolabe? Engrossing. Involving. Full of possibility and joy and friendship? Anyone who has ever tried to forgive a painful wrong done to them by another hears her own heart in Perrotte’s thoughts. 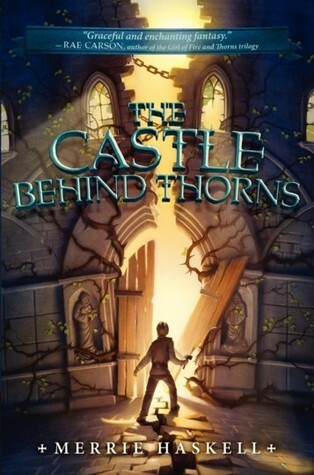 The Castle Behind Thorns is a brilliant example of story at its finest. I LOVED IT!